I had such a neat ephiphany this morning about how to explain merging of DISC Personality Types (extrapolate to your favorite personality profile!) and customer demographics using national advertising commercials. 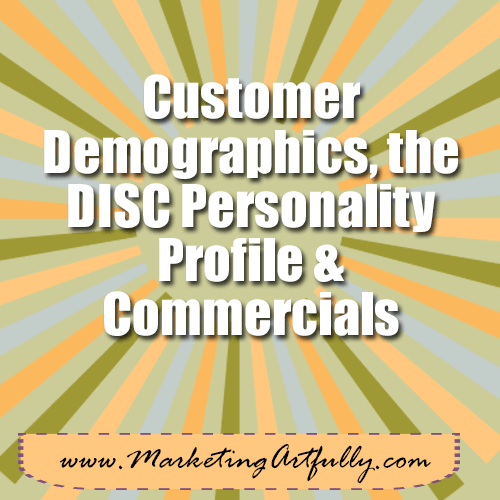 So how do you tell what types of demographics and personalities commercials are trying to reach? Here are some great examples and my take on them! First off we start with framing the commercial so that the watcher knows it is for him (using demographics). There is powerful man speaking in the background telling our business pro that he “knows how to mix business with business”. There are some really powerful “old boy network” images like the guys doing deals on the golf course. Our hero in this story looks to be a 30-40 year old white male (the “boss” in the story is his late 50’s, early 60’s). Then we switch over to the personality type of D for driver (ha, in this case an ACTUAL driver!) Our hero can choose any car and GO. No stopping, no hassle at the counter with talking to a person, just grab your car and go. While this is great for a dominant driver type, it would not work with our other personality types who would want to interact, have some structure or details about how all that is accomplish, but for our business pro, it is perfect! In this one our hero is a young woman, probably in her late 20s or early 30s. She seems somewhat affluent, the fixtures in the house are not opulent but are definitely designed well. There are a majority of white people in the shot although there is a bit of diversity and they are appealing to the moms with happy children playing. All that said, the hero shot is when she gets to enter the party and join in the fun. And come to find out, all those happy people are using Chinet plates. I’s like to be around people, having parties. They want to be the one getting to spend time with neighbors and friends and the promise is, if they pick up Chinet at the grocery store, they will be able to produce fun times. The other personality types who aren’t as social will not “get” this commercial, but I’s will love it! I pulled the Australian version of this one to show that these ideas are universal. It is interesting that each commercial has a voice over with the country’s accent, although they are all women. The shot starts with a cozy family home and flows through how family and ancestors are there for you and will help. Love the “and I saw you, coming home” – not only are we hitting the stable, steadys BUT also the visual people (42% of all people are visual learners!) Old family pictures bring humans into the shot and remind the S’s that family comes first. That said, this commercial is a C’s dream! You can find out any fact or detail instantly. You can know about important things like the weather and measurements. If you are a C (like my husband) this seems to be basic – OF COURSE you want to know all of that. For the rest of us, many times we have no idea of what the weather is until we walk out the door! Sometimes seeing how these play out help our small business marketing efforts. Selling a high end business product, you probably want to make sure your graphics and ads appeal to older white males who are still at this point running much of industry (they are stereotypes because they are true!) Want to sell to young, hipsters? Have images of people getting together and having fun! The national brands have amazing teams of marketing agencies, focus groups and deep pockets to test these things…as a small business owner you can leverage all that researching goodness to make sure you are targeting your best prospects!